It is estimated that 95% of Bank ATMs all over the world is running on Windows XP and Microsoft will withdraw technical support for Windows XP OS from April, 8, 2014.This means that Microsoft shall not issue any patch, security updates for Windows XP operating system leaving these ATMs exposed to new kinds of cyber-attacks, hacking, virus, spyware and malware. All banks are in race against time to upgrade their ATM. ATM contain hard cash at any point in time absence of security patches and technical support from Microsoft means leaving playground open for hacker. It is potential risk which all bank should mitigate. If bank fails to upgrade ATM with newer version of Windows all customer account might be at risk. Hacker may discover loop hole in system and this lead to fraud or unethical way to expose of information. Security expert believes that hacker can look at update announced for windows 7 and windows 8 and reverse engineer the code to find loop holes. Why Bank is not Upgrading their ATM? You must be thinking that although bank is knowing the risk why bank is not upgrading their ATM. We are herewith few reasons. Banks are not technically Equipped for this upgrades. Banks are not capable of making such huge upgrades. On some ATM machines whole hardware need to replace for upgrades, which is additional cost to bank. Bank is waiting for retrofit of small Hardware upgrade with low cost. 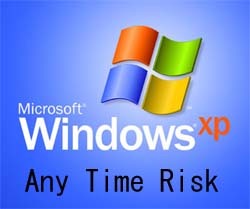 Many Banks are planning to take Microsoft paid support for XP. Microsoft said that it is important that one should migrate to a modern operating system such as Windows 8.1. This will give enhance benefit of enhanced security & higher user productivity at lower cost. Windows XP has more than 500 million users base and it is one of the most successful OS of Microsoft. Replacing it with new OS will defiantly take time. In India majority of public and private sector banks use windows XP for their ATM. As per Microsoft business person nearly 50% of Indian banking sector was on Windows XP till November. In India it is estimated that still 34115 Indian PSU bank branches is using Windows XP. One leading news paper says that still 52% of computers in banks runs on Windows XP. If banks will not upgrade all these machines by latest OS than they may face serious issues ranging from security breach to increase downtime and out of service issues. Time will reveal that ATM will remain as Any time Money or Any time Risk. Do you think money is at huge Risk?